Thanksgiving included four dogs, four cats and twelve people around the table. This was a smaller group for us than most years but a zesty one. From past Thanksgiving posts, you know how much I like finding out guest’s childhood Thanksgiving menus then including their twists in our meal. This year’s newcomers meant the addition of a broccoli cheese rice casserole which proved very popular as well as a very complex take on sweet potatoes in which things were mashed, pummeled, ground by hand then finished off with marshmallows submerged in the sweet potato matrix. It was a serious hit. Thanksgiving remains my favorite holiday especially since Ben has taken over full responsibility for the turkey. I love that the week before Thanksgiving I can wish everyone we connect with here in the office a Happy Thanksgiving because it is a holiday that belongs to all of us. Strange weather also seems to be common ground for just about everyone we connect with these days. Here in the north country, we had a serious snow storm on the day before Thanksgiving which morphed into a string of unseasonably warm “spring days”. The newly planted spring bulbs have been confused enough to be poking their heads through the ground. What do you say to a brave little fleet of Crocuses who stand poised to blossom? No! No! No! doesn’t seem to stop them. I am hoping that some last minute additional mulch will. Most of the farm projects are inside right now- Even with the soil still warm, there comes a moment when the shovels get hung up for the season ANYWAYS. I continue to work on the next edition of the Guide. In addition to trying to rework every Flower Essence definition with input from the Angels, Elementals and you all, I’m also sorting through all the testimonials you sent us for use in this next edition. Many of you have asked that we put these testimonials on the website as well as into the Guide, so I am making one big document to post on the website. When I started this project a number of weeks ago, I had several hefty files of testimonials we had saved since the last guide was printed. It is an incredible adventure to read your stories, and it fills me up with a great deal of gratitude. With every healing story I read, I feel so lucky to be part of Green Hope Farm Flower Essences. Isn’t that something to be thankful for? So many more letters to share soon. Bless each and every one of you who takes a moment to tell us your Flower Essence stories. I am so glad to be working on this project so all of you can hear all these stories! As I pour over these letters there is one other thought that fills me……. Thank goodness your handwriting is a lot better than mine! 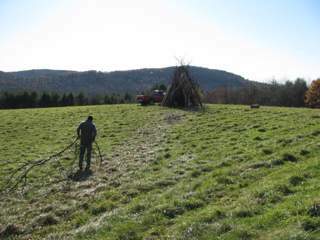 Some of you have been asking us what we are doing to prepare for 11-11-11. I am never quite sure what these events mean, but I like how they give us all a sense of occasion and an opportunity to celebrate new beginnings and our collective spiritual journey. During the Harmonic Convergence in 1987, we camped out in our half built house. It was our very first night in our new home and very special to get up at dawn to greet the sun rising over our first farm crop of buckwheat, planted to improve the soil. 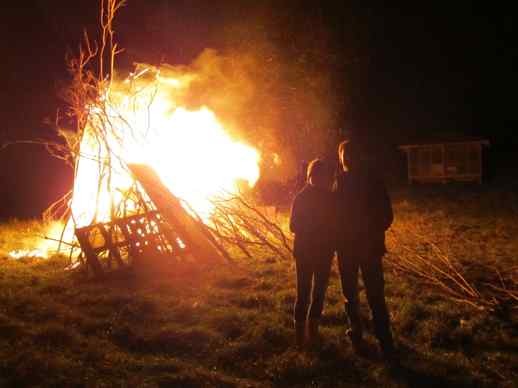 With 11-11-11, we decided to have a BIG bonfire. Jim, Emily, her friend Charlie and I dragged brush from the pile between Ben’s land and our land. Sometimes I have been put in charge of making the bonfires. As an earth sign, this doesn’t play to my strengths. Much as I need fire energy, a fire I build can often molder along in a dismal sort of way. 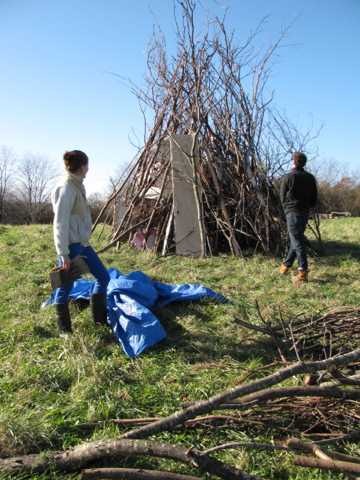 So this time I asked Emily and her friend Charlie who are both Aries to build the fire. 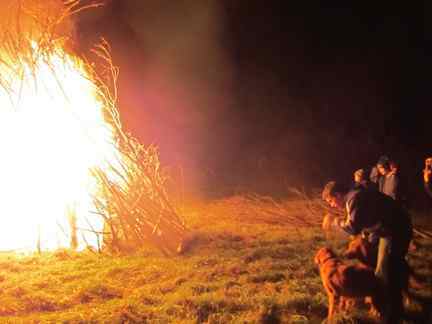 It was Ben’s thirtieth birthday last week so the bonfire was part of his birthday celebration. Here he is talking to MayMay about the blaze. It was a great decision to leave Charlie and Emily in charge of the fire. It lit with one match and was a towering inferno within about ten seconds. Here they are enjoying their creation, having been told they are now in charge of all future bonfires. 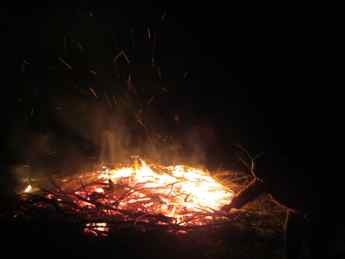 We also saw this fire as a dhuni, a purifying fire into which we could symbolically throw bindings and attachments. I was glad to have a chance to write down things I wanted to let go of and throw this list in the fire. And when the blaze settled down, we also used the embers to enjoy a few ‘smores. After all Will hadn’t had a snack in fifteen minutes and he was famished!